Refresher Safety Training: All school staff completed refresher safety protocol training prior to Winter Break. 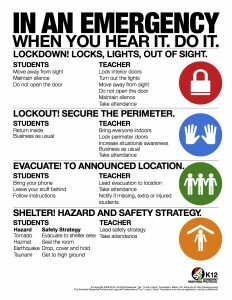 December Drill: A lockout drill was held Dec. 15 in all district schools. The purpose of the drill was to practice our safety procedures, test our updated emergency texting system, and to determine additional measures that need to be examined. Following the drill we conducted a debrief with each school and learned what areas we can improve upon. Student Responsibility: Please remind your students that when they “see something, say something.” They can report incidents to you or any adult at the school. Students should be reminded to text parents they are OK and safe when we are in a lockout or lockdown situation. District officials will share more detailed information with parents as soon as possible. Emergency Communications: We tested the new updates to our PCSD Chat system during the December drill. We can now text more than 5,200 parents and staff in less than 20 minutes, in both English and Spanish. The text contains a link directing you to the Emergency Update section ofthe district’s Newsroom. Emergency Procedures: All classrooms and public areas throughout the district now display a copy of the Standard Response Protocol procedures. A pocket-size version is available, in both English and Spanish, in the main office of each school. 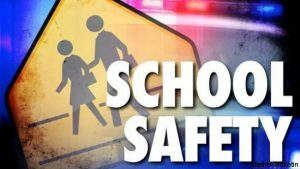 Policies Reviewed: The district is reviewing all policies and procedures related to safety and security. Hardware Updates: All intercoms in schools have been checked and repaired so an all-call can be heard by everyone in our buildings. We are increasing technology in some parts of the high school to allow for better Internet service. New App Piloted: During our last drill, Park City High School faculty tested “Loop,” a new app created by Loop Communications based in Park City. The app is designed for group messages and allows communications between the administration and staff. Elementary School Front Offices Update: Thank you for your patience as we upgrade the front offices in our elementary schools. We had planned to have the front office remodels completed during Winter Break, but there has been a delay in some of the materials. We anticipate those offices completed by the end of January. Once they are finished we will begin remodeling and updating the secondary school front offices. Safety Consultant: At the request of the Board of Education, the district is retaining a safety consultant to review all the district’s safety measures. Next Drill: Our next safety drill is Thursday, Feb. 1. We plan to hold districtwide drills each month. Thank you for your support as we continue to work at improving our emergency and safety procedures with students and staff.